Provinces in Canada have been experimenting with new approaches to justice for several decades, through programs on restorative justice. What is restorative justice? This article introduces the basic principles of that approach. It might be useful to start by contrasting the current system of retributive justice with restorative justice. While the former is about establishing guilt and punishing the offender, leaving little place for the victim who is treated as a simple witness, the latter focuses on problem solving, looks at possibilities for repairing the harm done, and gives a central role to the victim. 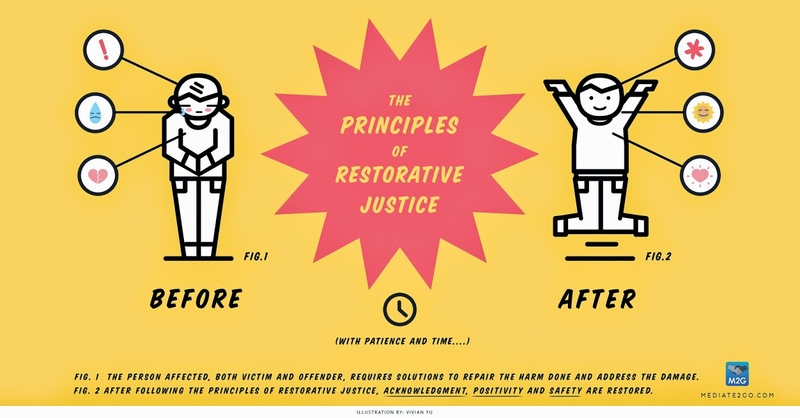 We suggest that the three main principles of restorative justice include the acknowledgement of the victim, the restoration of their positivity and reestablishment of their feeling of safety. Canadian aboriginal communities have used restorative justice techniques throughout their cultural history. Understanding the impact of the harmful behaviour: Appropriate response to crime requires the focus to be on the harm caused by crime and the full effects of the criminal behavior. Crime is not seen only as a legal issue (breaking the law). 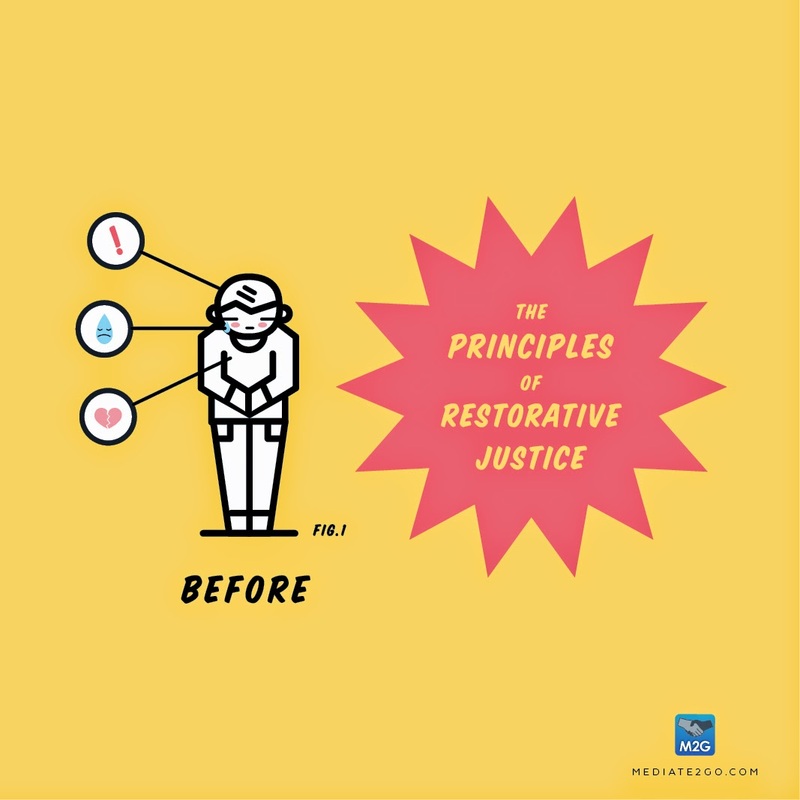 The process of restorative justice provides space to address damage to individuals, their property, their relationships and their communities. There is also an acknowledgement of harm created by the criminal justice process itself. Inclusion: All people affected by the crime are engaged in the restorative justice process, including the victim, offender, their individual support people and the community. Accountability: The process of restorative justice allows the offender to take responsibility for the harm created by their actions, directly to those harmed, including recognition of what occurred and corrective actions to address the harm done, to the degree possible. Through the hearing of all points of view, the community also has an opportunity to see its role in contributing to the crime. Safety: This aspect is defined as 1) the need to restore a sense of security to those impacted by the crime and 2) the need to create processes of restorative justice that are safe, respect the rights of participants and address power imbalances. Transformation: The long term goal of restorative justice is to provide opportunities for healing, personal growth, reparation of harm and restoration of positive relationships. Voluntary: Participants can choose whether to participate and can also make choices to influence the process design. Humanistic: Restorative justice is based on values of respect, compassion, dignity, honesty, openness, and growth. Fairness and equality/equity are also essential, as well as taking into account the multicultural issues. Interaction: Communication, either direct or indirect, between those impacted by the crime is typically required. Holistic: These processes take into consideration and value the full breadth of each individual participant as well as the larger context in which they function. This includes appreciation of the physical, psychological, mental, emotional, spiritual and social context surrounding each person as well as the environment. Interestingly, neuroscience seems to offer evidence that supports the implementation of these principles in our justice system. In this TED talk, The neuroscience of restorative justice, Daniel Reisel discusses his research on how we can help the brain re-grow morality. He explains that “the brain is capable of extraordinary change, way into adulthood”. He studied the brains of repeat offenders and psychopaths, for whom the amygdala, the part of the brain responsible for feeling empathy, is very small, and he suggests that restorative justice meetings could help stimulate the growth of the amygdala and thus reduce the potential of a repeat offence. While people with this condition might be considered the extreme, the fact that the brain can change when exposed to the right stimulation provides hope that restorative justice may have a positive impact on individuals and communities. Start your own restorative justice program with Mediate2go.com. It only takes minutes to get your directory page listed and case management system in place. With a bit of training, you can help contribute to justice in your community. Very good and important information. Here in Sarasota, Florida we have a restorative justice program for youth as well where they take 100% responsibility for what they created and work it out with skillful mediators about what they can do and why the behavior began in the first place. With all of the teen violence we have seen on American news lately, it is certainly time for new neural pathways to be created in the brain, however, much of the wrong education which might be given in the home which is where people learn unhealthy behavior then needs to be refocused on in schools. It is certainly a lesson many of us hope to be able to find answers to in this century to not only create a less violent world, but a world that works for all. Thank you very much for your thoughtful post! Do you offer RJ services yourself? Your program in Sarasota sounds very interesting. Our societies underuse RJ to their own detriment. The justice system is far behind, and everyone looses.